“We didn’t have anything,” Freeman told Fox News. “We tried several things – beds in the hospital, hotel vouchers – but the biggest thing the Defenders Lodge provided was capacity and consistency.” The Defenders Lodge was the result of a public-private partnership between the VA and the PenFed Foundation, which raised $11 million in donations to fund the construction of the lodge. The 52 room facility can house up to 104 veterans and has a dining room, library, and private outdoor spaces. Freeman said it is full every night of the year. James Schenck, President and CEO of PenFed Credit Union; Honorable Frederick F.Y. Pang, Chairman of the PenFed Foundation, Billy Bryels, Veteran; Lisa Freeman, former Director/CEO, VA Palo Alto Health Care System; Assembly Member Marc Berman (24th District); State Senator Jerry Hill (13th District); William Ball, Chief, Voluntary and Hospital Services, VA Palo Alto Health Care System at the Lee & Penny Anderson Defenders Lodge. U.S. veterans are forgoing treatment at Veterans’ Affairs clinics due to the high cost of lodging in some areas, but one group has a solution. 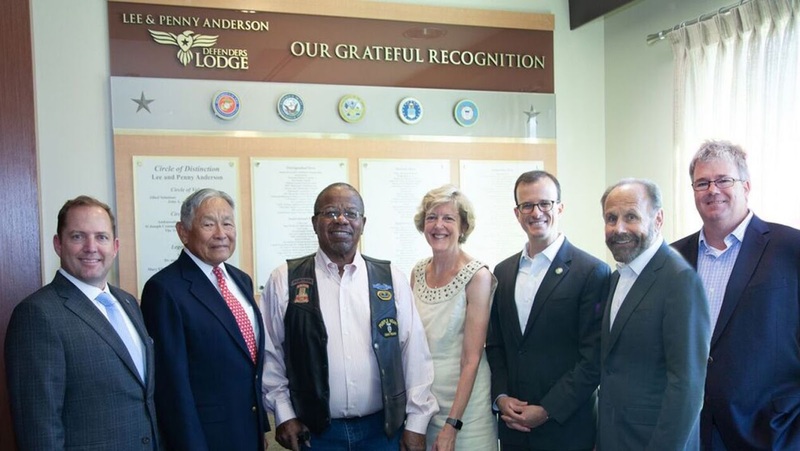 But today he is one of many who goes to the “Lee & Penny Anderson Defenders Lodge” located in Palo Alto, California, where veterans and their caregiver can stay in the state-of-the-art $17 million facility free of charge. He called it a God-send for veterans getting treatment. It was an idea former VA Palo Alto Health Care System Director and CEO Lisa Freeman thought of after hearing stories like Bryels’ of the veteran’s plight. Today, a hotel room runs at about $300-400/night in the area.